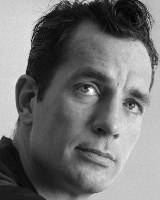 Jack Kerouac 12 March 1922 21 October 1969 American Leo Alcide Kerouac Gabrielle-Ange Lévesque T.V Writer, Novelist, Actor, Author, Poet, Painter American novelist and poet, considered as a literary iconolast and a pioneer of the Beat Generation. He is recognized for his method of spontaneous prose. A list of popular jack kerouac quotes are given below.